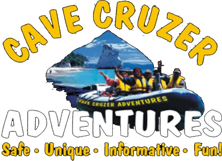 Cave Cruzer Tours operates daily from Boxing Day (26th Dec) till Waitangi weekend (6th Feb) and over Easter. From 6th February we are available for weekend tours and public holidays only. or phone us – 0276 633 449 to secure your tour. At all other times, we are available for group tours of 6-10 people. This is great for Groups, Parties, Schools and charter trips. Tours may vary depending on weather and chosen tour. Should conditions be unsuitable, your tour will be able to be rebooked for another day/time.